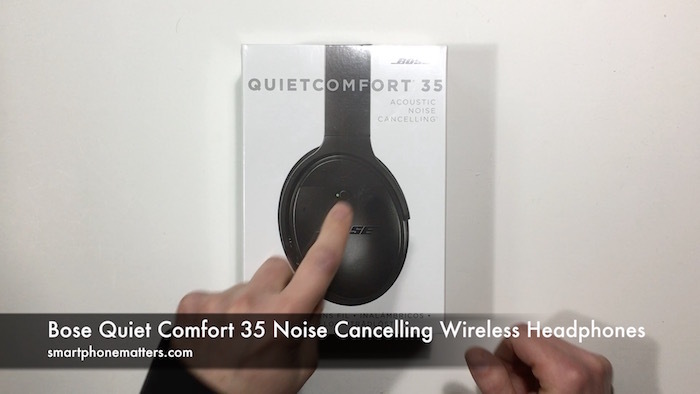 I recently received a pair of Bose’s QuietComfort 35 Noise Canceling Acoustic Wireless Headphones as a gift. I’m pretty excited about it so I thought I’d tell you about them in this article and my YouTube video. For those of you who don’t know, Bose is a leader in personal audio. One of their most well known products is their QuietComfort line of active noise canceling headphones. The latest top of the line model is the Bose QuietComfort 35. You can buy these online from Amaxon for $349. I have links below if you want to check them out. These headphones active noise cancelling, meaning when you put them out they can cancel background noise like airplane engines, appliciances, air conditioners, and other noises. You can use them to just to silence the noise or silence the noise while listening to music. Taking a look at the back of the box, you’ll Bose highlights the following features. Inside the box, you’ll find the usual manuals and warranty cards, as well a soft but sturdy zipped case. That case contains the headphones and all the accessories. Along with the headphones, you’ll find a charging cable, a wired headphone cable, and a airline headphone adapter. The charging cable is USB A to micro USB and is relatively short, at 6 inches.To use the charging cable you connect the micro USB end of the cable to the bottom right cup on the headphones and the USB A end to your computer or charger. The headphones do not come with a charger included. The headphones themselves are black and look pretty nice. The left and right cups folder over and the so the phones store flat and compact in the case. The headband is adjustable on both the left and right sides. The top of the band has soft padding. The cups are meant to go over your ears. The cup padding is soft and comfortable. The headphones are study and solid but also feel light in the hand and on your head. When I turned them on I heard a voice say the headphones are 70% charged and ready to pair. I was able to pair them with my iPhone 7 in less than a minute without issue. I did s quick sound check and thought they sounded really clear. The instruction card in the box recommended installing the Connect app on my iPhone so I did. The Connect app required me to select a name of my headset for Bluetooth pairing. Once connected, the app started downloading an update for the headphones. It took about 30 minutes to download. Once downloaded, I was able to update my headphones. I did not have to install the update right away to use the headphones. The QuietComfort 35’s have a set of controls on the back right side cup. There are three buttons for play, pause, and fast forward and rewind. You can also use center button to answer phone calls. The headphones can be used as a headset for calls. I was also able to use the controls on the side to activate Siri. Looking back at the instruction card, I see that the headphones can also be paired using NFC. I’ll see if I can do that with one of my Nexus Android phones later. Since I just opened these I haven’t spent a lot of time using them next. I want to use them to listen to music both wirelessly and with the wired cable to hear how they sound. I’d also like to use these with my iPhone, my Mac, and my Android phone. I’ll have to see if they support pairing with multiple devices. I’ll update this article after I have tried these out for a longer period of time but so far, they look and sound great.